Safety and overcrowding. These two things are at the top of every correctional facility’s list of concerns. 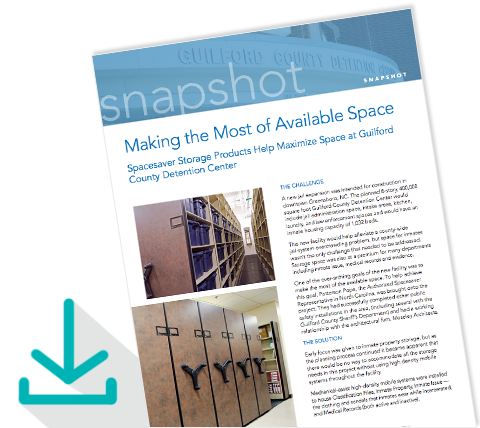 Luckily, there are smarter corrections storage options for every area – from inmate property to tool rooms to records and beyond. We’ve designed these products with safety and space in mind to create more efficient workflows, more secure facilities, and above all, a less stressful, more streamlined place to work. As corrections facilities have become more crowded, many inmate property rooms have found themselves unorganized and simply out of space. Add in the shuffling of property for court appearances, visitations, and hearings, and items can easily get misplaced, creating an even bigger headache for employees. Storing inmate property bins on high-density mobile shelving allows you to compact your storage to house more items in the same space, while allowing for quick, easy access to any bin when needed. This new detention center would help alleviate a countywide jail-system overcrowding problem, but space for inmates was just part of the issue that needed to be addressed with the new building—evidence, inmate clothing storage, and medical records were just a few of the many departments that had inadequate space to effectively perform their duties. Corrections centers often store tools for vocational programs and general maintenance, but need additional security measures to ensure that all items are accounted for – especially considering that lost tools can mean potential lockdowns and a waste of time and money if the tool was simply misplaced in the Tool Room. With a sliding pegboard and hook system, it only takes a quick glance to perform a visual inventory of the hanging tools. 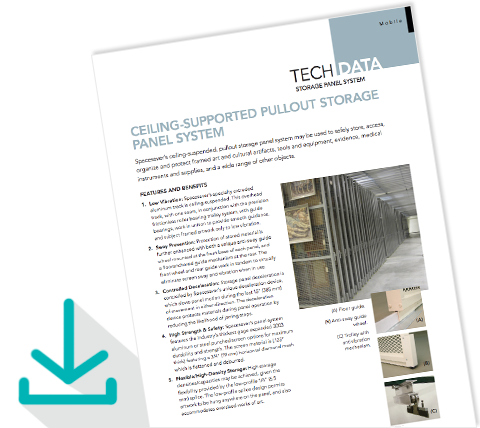 Larger items like drills and power tools fit easily in a high-density mobile shelving system for quick access. Art racks have helped numerous museums over the years compact art collections in a smaller footprint and still provide full accessibility to their entire collection. Learn more about this solution of Mobile Art Racks. A small city within four walls. Keeping track of medical records and prescriptions for hundreds of inmates at a time is like running a small-scale hospital records department. High-density mobile filing and prescription storage solutions ensure security and accessibility for medical storage at corrections facilities. In sally ports, common areas, and other areas where inmates and visitors are transferred, weapons must be accessible but highly secure. Secure weapons lockers with neoprene-lined shelves eliminate noise and weapon damage to offer maximum safety for temporary handgun storage. Kitchens and work areas are often overlooked when it comes to storage at corrections facilities, but house many items that must be organized and accounted for at all times. From storage lockers for personnel belongings to shelving of all types, we offer solutions to make work areas more efficient, more streamlined, and more pleasant to work in. Touch Technology Control provides an additional layer of security and usability to your corrections storage system. The intuitive LCD touchscreen not only controls the movement of the system, but can be used to restrict and track aisle access in storage, inmate records, and more.